The marine soul is the striving for victory. The Marine's strength is irrepressible, persevering, single-minded. That’s why the enemy calls the Marines on land a “black cloud,” ”black demons.” Thus wrote of the Marines Leonid Sobolev, the writer-Marine greatly loved in the fleet; and no one could have said it better. The image of the Marine in a sailor’s cap and pea jacket, girded by ammunition belts, has been forever ingrained in the minds of our people as a symbol of courage and heroism. The Marines' military traditions have been shaped over the course of several centuries. A regiment of Marines was created by a decree of Peter I from November 16, 1705. The Marines’ history begins with this decree. Today, November 16, which is November 27 by the new calendar, is celebrated as the day of the Marines. The first Marine regiment consisted of two battalions of five companies each, and listed 45 officers, 70 petty officers and 1250 enlisted men. The Great Northern War was under way, the Swedes directing their forces to attempt the capture of St. Petersburg almost every year. In these battles the Marines’ combat mastery was perfected and their military traditions established. Glory was not long in coming. In the Battle of Gangut on July 27, 1714, Peter I personally led the Marines' attack on a detachment of Swedish ships. The enemy tenaciously resisted. They managed to fight off two attacks, but the third ended in complete victory. Peter I marveled at the fearlessness and irrepressible strength of the Marines' military charge. Thereafter came Chesma, Navarino and the unprecedented in history capture of the naval fortress of Corfu. The Marines' heroism and military valor were made especially evident in the Patriotic War of 1812. On the Borodino battlefield, among 34 obelisks erected here in honor of that war’s heroes, there is a monument of the Imperial Guard, majestic in its austere and memorable beauty, to the Jaeger regiment and Marines of the Guard company. They came here with Barclay de Tolly’s army from the western border of our Homeland, overcoming 300 versts of the roughest travel. Responsibilities of the Marines included the construction of bridges and portages to hasten the progress of our army, as well as tearing them down with the approach of the French. Often this took place under enemy fire, with great losses. In the Battle of Borodino, a detachment of 30 Marines headed by warrant officer M. N. Lermontov was given the task of staking out a bridge over the Kolocha stream, which separated the Russian Jaegers stationed in the village of Borodino from the main positions of the right flank of the Russian troops. Kutuzov ordered the Marines to destroy the bridge in the event that the Jaegers leave, and to prevent the French from fording the river with heavy rifle fire. On the morning of August 26, taking advantage of the heavy fog, the French staged a surprise attack on Borodino. The Jaegers held bravely, but under great losses were forced to retreat across the bridge to the left bank of the river. The Marines immediately set fire to the bridge. But the French 106th regiment was advancing so aggressively that they rushed right onto the burning bridge. The Marines had to dismantle the bridge planks while at the same time engaging the French in hand-to-hand combat. Barclay de Tolly saw the fierce fighting at the bridge and sent in two Jaeger regiments to assist. The joint effort succeeded in destroying the French 106th regiment and the bridge. Thanks to this, the right flank of our troops was defended from French advance. This heroic feat of the Marines and Jaegers was immediately reported to Kutuzov. Warrant officer Lermontov, having been wounded in the battle, was honored with the Order of St. Anne of the 3rd degree, and various commendations were bestowed on all the Marines of his detachment. The military command of the young Soviet Republic highly valued the excellent ethical and combat qualities of the Marines. In January of 1918, a directive of the People's Commissariat for military matters indicated: "It is necessary for the purposes of cohesion that each echelon of volunteers (of 1000 men) is assigned a platoon of comrade Marines." In the years of the civil war, 75 thousand Marines fought on ground frontlines. The names of A. G. Zheleznyakov, B. F. Lyubimov, N. G. Markin, M. I. Martynov, V. A. Mokrousov, P. D. Khokhryakov and many others will never fade from posterity’s memory. Unfortunately, the experience of the Marines was not consolidated and utilized to an adequate degree in the prewar years. 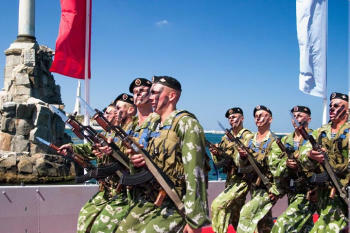 By the beginning of the Great Patriotic War the USSR Navy included only one Marine brigade, while the need for them arose practically in the first hours and days of the war. Making up for lost ground had to take place under the most difficult conditions of the beginning stages of the war. During the course of the war, over 30 Marine rifle brigades, 21 Marine infantry brigades and several dozens of separate Marine regiments and battalions were created. 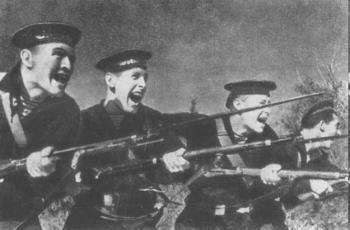 In the fierce battles on the Danube and on the coastal flanks of our armies, in the defense of naval bases and coastal cities, the Moonsund archipelago and the Hanko Peninsula, as well as on overland frontlines far removed from the sea, by Moscow and in Stalingrad, the Marines’ renown grew and strengthened. The most significant and heroic form of the Marines’ combat activity became the amphibious landing. The Marines conducted their own, or else came in the first assault, creating the conditions for subsequent landings of ground-based units. At first these Marines did not have any special weaponry or equipment, there were no specially-designed assault landing ships, the means of communication were very weak, the interplay with artillery, airborne and ground-based units was poorly developed. War forced these deficiencies to be quickly remedied. The broad development of the Marine forces in the years of the war, the importance and breadth of the responsibilities they fulfilled, allowed them to become transformed into a separate branch of the Navy. The war passed, and due to the euphoria surrounding the nuclear-missile weapon, the Marines were discontinued. This aberration lasted a relatively short time. In 1963, the first Marine units were again created, the fleet began receiving specially-constructed amphibious landing ships and vessels for artillery support of landing forces, specialized weapons and equipment for assault troops were created. The Marines took their rightful place in the naval forces and began to take active part in serving combat duty in Egypt, Syria, Vietnam, and many other nations. And recently we learned of the Marines' heroics in a counter-terrorist operation in the northern Caucasus. Kamalov H.H. Morskaya pehota v boyakh za Rodinu (The Marines in Battles for the Homeland). Moscow, 1983. Ternovskiy G.V. Voyennye moryaki v bitvakh za Moskvu (The Marines in Battles for Moscow). Moscow, 1968. Borzenko A. “Primeneniye morskoy pehoty v gody Velikoy Otechestvennoy voyny” (“The use of the Marines in the years of the Great Patriotic War"), Morskoy sbornik (Marine digest), ¹ 5, 2005. Moskva i sud'by rossiyskogo flota (Moscow and the Fates of the Russian Fleet). (Archive documents and historical sketches.) Moscow, 1996.